Don’t have time for gardening, but still want to an outside space you can be proud of? It’s possible to create a beautiful garden without having to pour hours of hard work into it every week. Here are just a few tips for designing a low maintenance outdoor space. Plants will always require a bit of maintenance, but there are certain shrubs that you can pretty much leave up to their own devices with only occasional water and feeding. Opt for evergreen perennials that won’t lose their leaves and will survive for years to come. Succulents will require very little attention at all, whilst hydrangeas can offer vibrant colour all year round whilst surviving harsh conditions. Laying down mulch on soil can provide plants with a steady source of nutrition for months to come – the mulch slowly degrades and helps to keep the soil fertile. You can also put plants in large pots to help soil retain water, as well as giving each plants its own individual soil source. 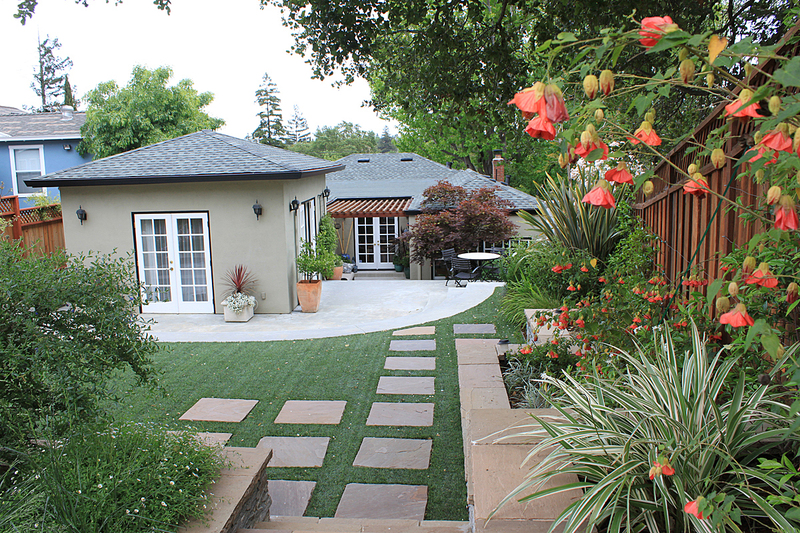 When it comes to creating a designated social area, think twice about laying down gravel. A gravel area will need to be regularly raked to keep it evenly distributed, whilst leaves and litter can get caught in the gravel. A patio or decking area is more expensive to install, but it’s easier to keep clean and presentable. Providing it has been sealed and the ground below has been thoroughly de-weeded, the only maintenance your patio or decking will need is the occasional clean with a pressure washer. You can find discounts from VoucherCloud for pressure washers and other garden tools. Hire a professional to install your patio or decking to ensure it’s built to last. As for garden furniture, there are certain materials that are more weatherproof than others and will require less maintenance as a result. Cheap woods and plastics will rot and warp easily in the sun and rain, whilst cast iron will stay sturdy but may rust resulting in regular coats of paint needing to be applied. Try to invest in garden furniture that can withstand the elements such as galvanised aluminium, rattan, synthetic fibre and sealed cedar. If you’re tired of mowing and watering your lawn just to keep it presentable, it could be time to make the switch to artificial grass. Diehard gardeners may turn their nose up at it, but if you’re simply looking for a low maintenance solution, nothing beats the convenience of fake turf. You don’t have to cut it or water it – other than occasionally brushing it, artificial grass is practically no-maintenance. You can buy affordable fake turf from sites such as Cheap Grass.